Grasshoppers belong to the scientific order Orthoptera; crickets are close relatives that also fall in this order. 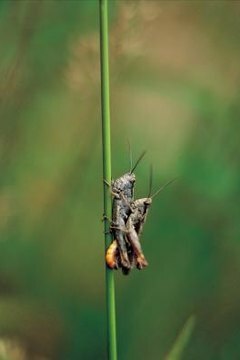 Grasshoppers may be common in various parts of the country, but these creatures have some interesting behaviors and characteristics that help them stand apart from the crowd. Grasshoppers can leap 20 times their own body length, largely in part due to their enlarged, muscular back legs. That's useful for getting around, particularly for nymphs who haven't developed their wings yet. Some species of grasshopper are quite noisy; some males will rub their wings with their legs or vibrate them to attract a female to mate with. Their relatives, the crickets, also perform these songs to attract mates but rub their wings together. According to North Carolina State University, grasshoppers "cause more damage to alfalfa than any other insect in the Midwest." The University of Georgia Savannah River Ecology Lab website says grasshoppers cause $80 million worth of damage to crops annually. Some species are more damaging than others, including the red-legged grasshopper, differential grasshopper and two-striped grasshopper. In many cases, grasshoppers occur in swarms of hungry, voracious feeders ready to attack their preferred food source. While this isn't a big agricultural concern in the United States, it's a large problem in Africa and Asia. During these swarms, catching or accidentally walking into one of these flying pests is a matter of course. Unfortunately, many species of grasshopper will spit out a bitter, brown liquid as a defense against predators. Picking up one of these leaping creatures will sometimes result in this brown liquid getting all over your fingers or clothing. It's not uncommon for female insects to dig out holes to lay their eggs; it's not quite common for them to dig the holes out with their abdomens like grasshoppers do, though. The female uses her spadelike ovipositor to transfer eggs into a soil enclosure. In order to molt, grasshoppers swallow a large amount of air that results in splitting the cuticle. This makes it simpler to break out of the old exoskeletons. The tympana, or eardrums, for many grasshoppers are located on the forelegs; other species have tympana on the abdomen. The tympana are the membranes that allow them to hear. The grasshoppers ears aren't the only interesting sensory mechanisms, it also has five eyes. When looking at a grasshopper, its two largest eyes are conspicuous, one on each side of the head. These are the insect's compound eyes; they also have a single eye at the base of each antenna and another single eye located just below and centered between the antennae. What Bugs Are Related to the Cockroach? What Are the Palps on a Grasshopper? Do Male or Female Ladybugs Have Spots? What Is the Grasshopper's Job?